Nothing like the taste of fresh homemade cookies. If you are looking for a new recipe to try, I have just the thing for you. It is a recipe for homemade butter pecan cookies! This recipe is pretty easy and only takes about 12-15 minutes to bake. After they have cooled, you will need to store them in an airtight container to keep them fresh. So grab your mixing bowl and cookie sheet and let’s get started! If you like this recipe, here are a few others to check out. 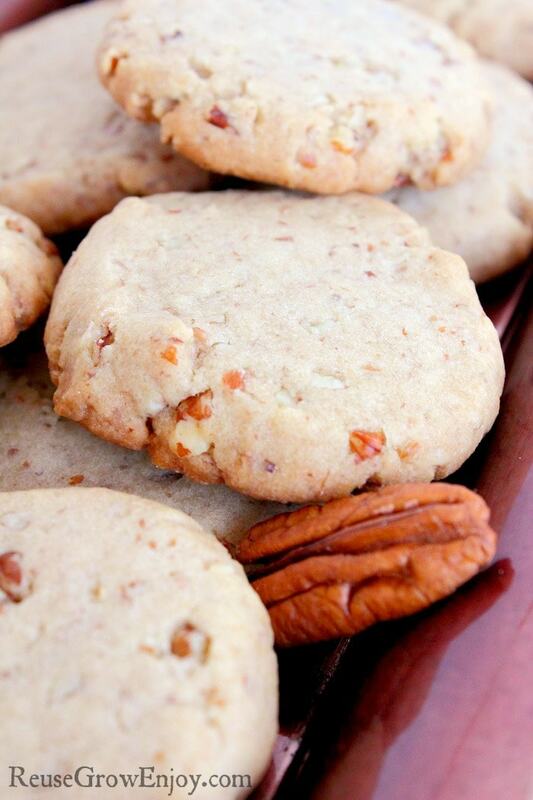 The must try amazing tasting homemade butter pecan cookies. You will never buy store bought again! In a mixing bowl cream together the sugars and butter. Now add the baking soda, flour, vanilla and salt. Mix until fully combined. Knead a few times until smooth. Next add the Pecans to the dough and knead until mixed. Make tablespoon size balls and place on a lightly greased baking sheet. Flatten the balls with the flat bottom of a glass. If the edges crack gently reform using your fingers. Bake until the bottom and edges are golden brown, 12-15 minutes (rotate the sheets 180˚ and switch racks after 7 minutes).